Composer and conductor Nigel Hess will lead the Royal Philharmonic Orchestra together with the Cantus Ensemble, tomorrow Tuesday 16 of April, at the Royal Festival Hall of London (United Kingdom), in a concert dedicated to William Shakespeare’s extraordinary words, brought to life with orchestral and choral music from stage and screen. The concert, entitled ‘The food of Love’, will have the participation of baritone Morgan Pearse and soprano Elin Manahan Thomas, being narrated by Sir Derek Jacobi and Frances Barber, with famous excerpts from Shakespeare’s plays and entertaining theatrical anecdotes. 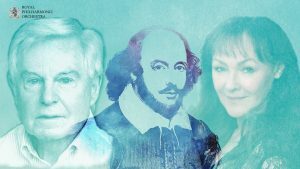 The evening will feature musical highlights from the scores of Craig Armstrong (Romeo + Juliet), Stephen Warbeck (Shakespeare in Love), William Walton (Henry V Suite), Nigel Hess (Royal Shakespeare Company productions), Henry Purcell, Roger Quilter and Ralph Vaughan Williams.